This is the first in a series of articles about how the Providence St. Joseph Health digital team is helping you get care how, when and where you need it. When you hear “Silicon Valley,” health care is probably not the first thing that comes to mind. But, as it turns out, Providence Health & Services is a lot more like a technology company than you might expect. That’s what lured Aaron Martin, Providence’s chief digital officer, away from a successful career in the tech world, most recently at Amazon. When drawing parallels between Providence and a tech company, he cites Providence’s noncommercial-based Mission (common among tech companies) and the forward-thinking leadership of Providence. Another similarity is Providence’s culture of innovation, including the notion of innovative disruption—that if we don’t try something new, someone else will. Martin’s team is responsible for creating digital products and services that will transform health care to become more customer-centric through the use of technology. Delivering specialty care through telehealth—video conferencing systems that enable a specialist to connect with their colleagues from an urban hospital to a rural location where fewer specialists are available. Martin says that Providence currently has more than 100 of these telehealth carts out in the various hospitals across the health system. “Express Care is about delivering convenience—high-quality care for minor conditions when and how a patient wants it, at lower cost,” explained Martin. For people who can’t make it to a conveniently located Express Care clinic, they can use apps designed by Martin’s group to have a virtual visit, interacting with a health care provider via video call from their phone, tablet or computer. They can also schedule a house call, where a provider comes to their home—like Uber for health care. Or, if they just want to find an Express Care clinic nearest to them and schedule an appointment in one click, they can do that through the app as well. For most patients, unless they are chronically ill, they are not used to engaging with their doctors more than a few times each year. 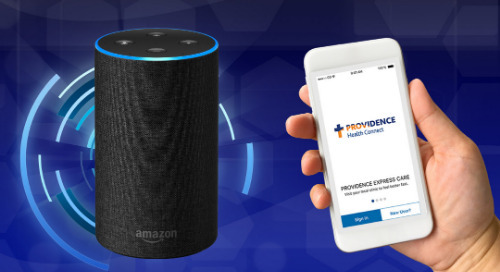 But Martin sees that frequency increasing by giving health care providers more chances to improve the health of their patients using digital as a way of scaling the service to the millions of patients Providence serves each year. These digital innovations are key in supporting Providence’s efforts to make the communities we serve healthier. One example of how Martin’s team is helping create more connections between patients and their health providers is an app they created called Circle that is available to expectant mothers. Circle addresses that need – supplying curated articles and clinically approved answers to common questions and convenient access to health resources. Circle personalizes the information it delivers based on how far along a pregnant mother is. And, once a child is born, Circle continues to supply relevant health information through that child’s 17th birthday. The longer-term vision for Circle is to be a personalized health solution for mom who is the “chief medical officer” of the home and makes 80 to 90 percent of the health care decisions in the home for her family. Martin’s team is also using a technology developed at Providence called Xealth to connect patients with their health providers by giving doctors the ability to prescribe digital information like articles and videos, apps and devices to their patients. If prescribing digital information isn’t a concept you’re familiar with, you’re not alone. Imagine after you’ve visited a doctor, that instead of receiving a printed set of instructions or explanations about a specific health issue, you receive that information digitally on your phone or computer, and in a much more engaging format. For instance, for patients who are at risk for diabetes or heart disease, doctors can prescribe an app called Omada, that provides a 16-week online digital health program, including a wirelessly connected bathroom scale, a full-time health coach and an online support group. Xealth enables doctors to prescribe apps, digital devices and programs straight from their computer systems that they’re already using to prescribe prescription drugs. And, when patients download a prescribed app or starting using a prescribed device, their progress is reported back to the prescribing doctor, who can keep tabs on how a patient is doing. The challenge, he says, is finding something that his group can do that will move the needle—something that will fundamentally increase the quality, affordability and availability of health care, make clinician and caregiver’s work easier, and eventually help improve the health of a large group of patients. When deciding where to focus their efforts, the digital team sizes up each potential project by asking some specific questions. Is the problem we are trying to fix something that requires technology to fix it, or is it technology that we already own? If we can’t use our current systems, then can we partner with a company that is already solving this type of problem and is successful at doing so? For these solutions that need to be found externally, Martin wears another hat as the head of Providence Ventures, a division that funds early-stage companies and connects them with our world-class doctors and care providers. Providence Ventures has made many introductions to the business that have resulted in commercial agreements and has made nine investments thus far. One product that came out of this program is Sqord, a game-ified wearable fitness tracker for kids that improves activity levels in the most sedentary kids by greater than 60 percent. Martin’s team will be serving this community with technology “where it makes sense,” but also using innovative models that work in Providence’s ministries or other health systems. This is where Martin’s team leverages the experience of other health systems from across the country in addition to our own experts from our local ministries and regions. “We do little actual innovation, we’re the ‘paying attention team.’ We spot problems a team in our local ministry has already solved or that another health system has solved, make sure they work and bring them to scale,” Martin said. As one example, based on evidence collected from other health systems, one of the most efficient ways to stay connected with a Medicaid population, especially the most at-risk people, is to give them free or subsidized cellphones and communicate via texting. There is also a lot of technology that can be used to more efficiently match patients to social services because social determinants like housing, transportation and nutrition have such a huge impact on health. “This is by far the best part of my job and the reason I came to Providence – helping people with technology and innovation. If you talk to my team, they would agree with that sentiment. It’s about the Mission and why we’re here,” said Martin. Learn how one farmer sources food locally to teach her family about sustainable nutrition.